With Road Safety Week 2018 now in full flow, local authorities and police forces across the UK are focusing on improving the safety of cyclists and motorcyclists. Throughout Road Safety Week we are running a daily news update covering what’s happening around the country. Simply send details of your activities by email to Edward Seaman at Road Safety News and we’ll feature them in our roundup. The road outside a Bristol primary school was closed to traffic yesterday morning (19 Nov) as young children took to their bikes to launch Road Safety Week 2018. Children and their families from Brunel Fields Primary School joined residents of Arthur Milton Street for a street play session organised by Brake and the Bristol-based national street play organisation, Playing Out. 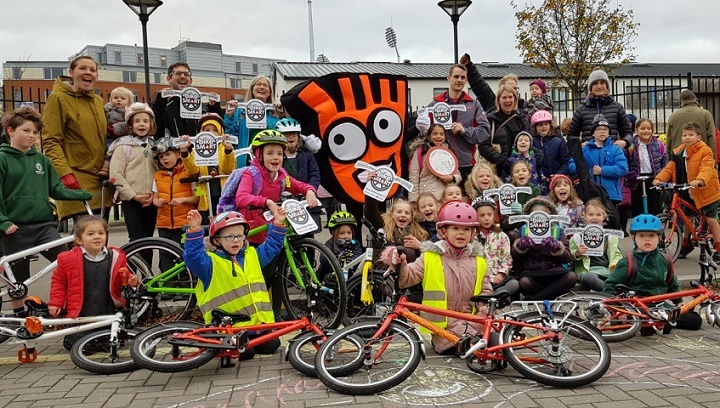 The street play event took place between 8-9am to allow pupils, their families and residents to enjoy cycling without fear of traffic – and highlight how street play sessions can create safe, pollution-free spaces within communities. Cheshire Fire and Rescue Service and Cheshire Police have joined forces to educate road users – with a number of events organised across the county. PC Kerry Christmas, road safety officer, Cheshire Police, said: “Road Safety Week is an ideal opportunity to get local people to support us to work towards safe and sustainable travel for everyone. Andy Gray, Cheshire Fire and Rescue Service’s road safety manager, said: “This is our busiest time of year for conducting road safety events, and this year you’ll see us wherever we can find motorcyclist hotspots, cycle paths and thoroughfares popular with the two wheeled travellers. Kent Police officers are asking motorists and cyclists to be ‘bike smart’ and think about the impact that their behaviour can have on other road users. Chief inspector Richard Smeed, Kent’s Roads Policing Unit, said: “Close passing a cyclist is a dangerous and unnecessary risk; they may have to swerve to avoid a pothole and if you haven’t given them enough space, you could end up involved in a serious collision. “If you are the parent of a child riding to school, encourage them to wear a helmet, make sure they are aware of the Highway Code and that they are visible in poor light. As part of its Road Safety Week efforts, Brighton and Hove City Council is giving away 10 wrist mounted cyclist mirrors – courtesy of a local inventor. The MyKlops mirrors have been donated by Mark Jay, along with 100 blindspot mirrors for cars. For more information, visit the Share the Roads, Brighton & Hove Facebook page. Elsewhere, the council is promoting a new video which comprises an interview with Goldie Khera, a local lead trauma consultant, in which he advocates the use of cycle helmets. The road safety team is also hosting a ‘Safe Drive, Stay Alive’ event today (20 Nov), for sixth form students from across the area. Performances of ‘The Passenger’ theatre in education production for Year 11 students – sponsored by Sussex Safer Roads – are also taking place throughout the week. 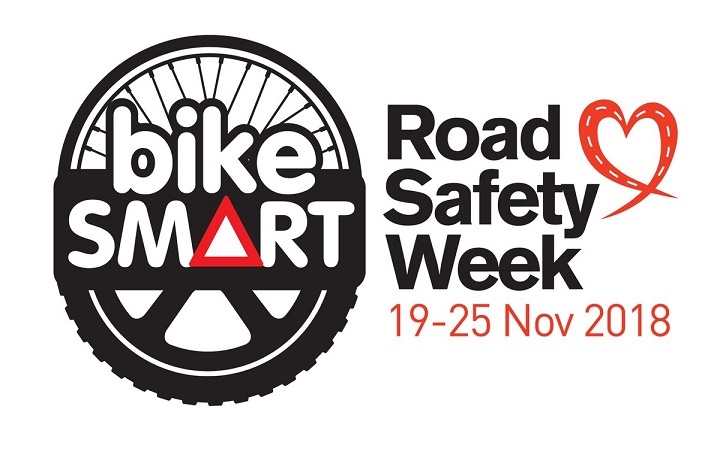 Finally, there will be a BikeSmart event at Lancing College Preparatory School on Friday (23 Nov) covering cycle maintenance, practical skills and a ‘protect an egg’ challenge. In advance of Road Safety Week, Safer Young Drivers (formerly Accelerate Driver Training) has been working with The Wavell School in Farnborough to address concerns voiced by local community members about the way in which pupils were cycling on their way to school. 15-minute cycle safety presentations were delivered to year groups, with unannounced safety checks carried out on pupils’ bikes – with the results fed back to parents/carers. The programme is also picking up the ‘Bike Smart’ theme during Road Safety Week – through a banner placed at the entrance to the school.